Help support all that Bader Hillel Academy does for our children. 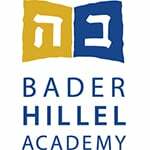 #GivingTuesday I want to support Bader Hillel Academy on Giving Tuesday! Please send a card to the Tribute Recipient or family in acknowledgement of this donation.